On our website you will be able to find the correct answers to the most difficult and challenging crossword clues every day. 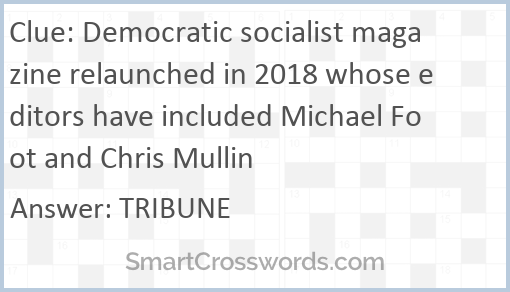 We are delighted you are looking on our site to find the answer for Democratic socialist magazine relaunched in 2018 whose editors have included Michael Foot and Chris Mullin crossword clue and we hope this is the only site you'll need to solve crossword puzzles each time. You can see the solution to the crossword clue Democratic socialist magazine relaunched in 2018 whose editors have included Michael Foot and Chris Mullin on this page. We solve crosswords from newspapers and magazines every day and are happy to assist you.